Memorial gifts may be made in Jeanne's memory to the Candia Community Woman's Club. We are so grateful for all our cherished memories with Jeanne in the Candia Community Woman's Club. We all are truly blessed to have worked with Jeanne on so many of our projects and those memories will always live on in our hearts. Thank you Jeanne for the laughs, smiles and inspiration. You will be greatly missed. "Those we love remain with us for love itself lives on, and cherished memories never fade because a loved one's gone. Those we love can never be more than a thought apart, far as long as there is memory, they'll live on in the heart." 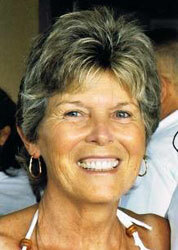 Please write "Jeanne Cole Memorial Gift" in the memo portion of your check. Contact us with any questions at contact@candiawomansgroup.org.